It's rare that a company can save lives while revitalizing a neighborhood. But that's just what United Therapeutics is doing with their boldly designed new headquarters at Spring and Cameron streets in downtown Silver Spring. Not only are they making medicine, but they're giving the community a place they can be proud of. Founder Martine Rothblatt started United Therapeutics in 1996 to find a cure for her daughter, who was suffering from pulmonary arterial hypertension, a disease that creates difficulty in breathing. The company licenses, markets - and will eventually produce - three drugs that improve blood flow around the heart. As the company grew, they've built two new buildings across from their original offices on Spring Street, the second of which opened earlier this year. The new building contains corporate offices, research and development facilities, and space for manufacturing medicines. Together, the complex could employ as many as 150 people. County planners are already big fans of the development. 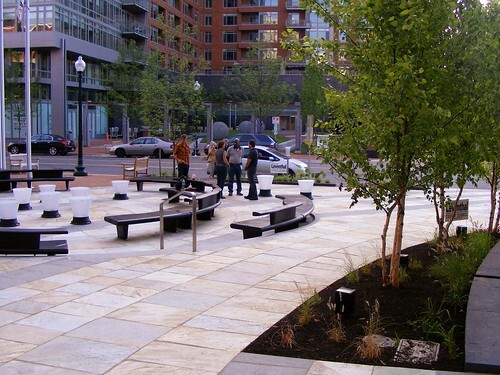 "In all, the entire space, including well-integrated plantings, water feature, seating, artworks, and architecture, is an exemplar of design excellence that we – as a county – should emulate," wrote Joshua Sloan on the Montgomery County Planning Department's blog, The Straight Line. The plaza with the Cameron, a new apartment building, in the background. 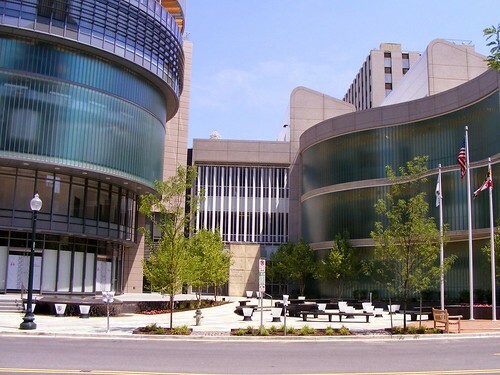 Most people won't ever have a reason to go inside, but they'll catch glimpses of United Therapeutics' work in a spectacular new plaza along Cameron Street. There, designers at Schick Goldstein Architects have created something hard to find in downtown Silver Spring: an attractive pocket park. Two weeks ago, I visited the complex when it played host to a "Community Conversation" hosted by my boss. There, I saw Paul Mahon, UniTher's Executive Vice President for Strategic Planning. "We wanted to provide a lot of surprises to make it as exciting outside as we think what's happening inside is," he explains. "We wanted to give back to the community with an interesting building and great public spaces." Outside the meeting, I ran into Jill Schick, principal of Schick Goldstein Architects. She was there with a professional photographer taking pictures of their new building and showed me around the plaza. Stools with geometric patterns or the names of elements on them litter the space. (They glow different colors in the dark.) A flat, round fountain drowns out the din of traffic, while discreetly placed speakers play New Age music. 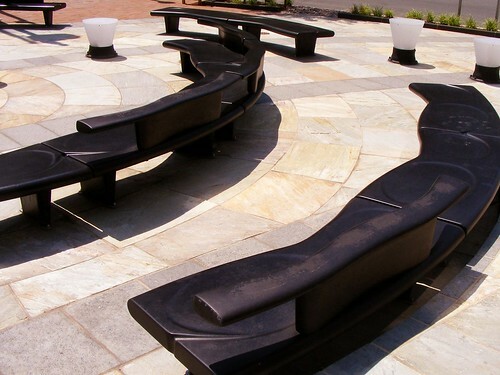 But the most compelling part of the plaza are the benches, which came from Argentina and form concentric circles. Jill explains that they're made out of concrete, but you wouldn't know it from their smooth, black finish, giving the impression of a much softer material. Pressing your thumb against the bench, you expect it to give a little as if it were made of plastic or rubber. The finish is already worn in some places. "You can see the skateboarders have already gotten to them," Jill laments. It's likely that kids came here to skate because no one else is around. On Saturday, I return to the plaza and run into John Wetmore, a Bethesda resident who hosts Perils for Pedestrians, the nation's only TV show about pedestrian issues. He asked me what I was taking pictures of, and I explained how much I like the new plaza. "What's it look like at lunchtime?" he asks. "Is it full of people?" Other than a plastic cup someone left on one of the benches, there isn't much evidence that people come here to eat. Much of the new building's first floor has been set aside for stores and restaurants, though it's vacant. (UniTher's currently using it as an "Education center" to give the public a first-hand look at what they do.) When the space is filled, Jill says that a portion of the plaza has been set aside specifically for outdoor dining. The façade is compelling, but leaves much to the imagination. Earlier this week, George and I took a tour with Pat Poisson, Vice President of Manufacturing and Facility Operations. He's worked for other pharmaceutical companies before, and notes that it's "very unusual" for one to locate in the middle of a city. "It's a unique approach and it's great to be a part of it," he says. "We don't have to get in the car and drive to lunch." Inside, what's most exciting are the spaces you can't see. We can't say much about what happens there, as a lot of the equipment is proprietary and pending FDA approval so they can actually start making medicine. But I can say that the opaque glass walls that cover much of the building's street frontage hide mundane things, like offices and mechanical rooms. As is the case downstairs, the most compelling part of the building is outside. 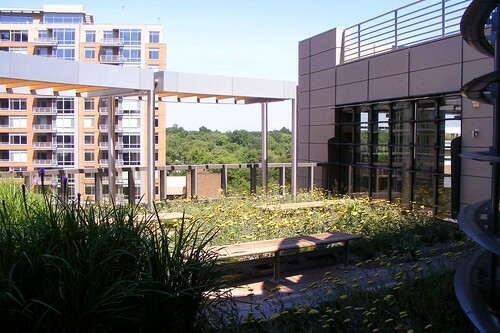 The sixth and seventh floors, containing the company's corporate offices, open onto roof decks with panoramic views of downtown Silver Spring. They're covered in lush vegetation, making them feel less like a roof and more like a garden. United Therapeutics' sixth-floor roof deck. From the deck, you can see Spring and Cameron streets, which today look pretty quiet but could become much busier in coming years. The Cameron, a new apartment building across the street, has its own pocket park and ground-level retail space as well. And UniTher's third building, set to replace their old offices along Spring Street, will include even more room for shops - not to mention, of course, a bridge over Cameron Street connecting it to the rest of the campus and a multi-story video screen. It will start construction "soon," say county planners. Former Washington Post architecture critic Benjamin Forgey once said "There are so many bad buildings in Silver Spring, it’s a hard place to do good." He might be due for another visit, because we've got some pretty great buildings to show him. 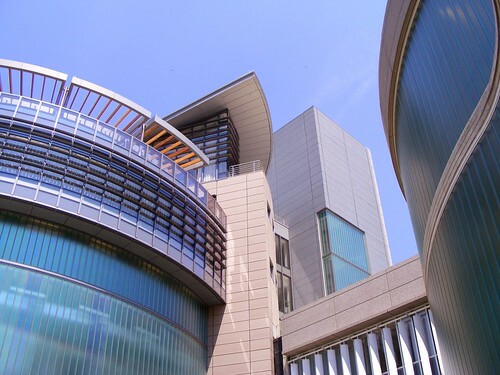 Check out this slideshow of United Therapeutics' headquarters, inside and out (but mostly out). I've been thrilled to see the buildings stand as they have been erected. The concept design was interesting and the completion is even better. There is outside water and lighting interest too. The now open building for the public gives information about the company within the museum, but also shows how good architecture can be interesting on both the outside and the inside. Kudos. Looking forward to the other buildings that will complete the project. We need more of this in Silver Spring.